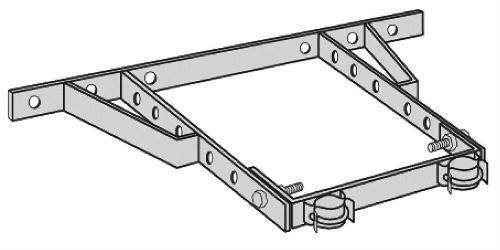 Rohn 25G House Bracket Assembly, Adj 0" To 24"
Rohn HB25BG 25G HOUSE BRACKET ASSY, ADJ 0" TO 24"
The ROHN R-HB25BG adjustable house mounting bracket for Standoff from House Wall up to 24 inches. This ROHN Tower HB25BG House and wall bracket offers greater support for ROHN Guyed, Bracketed and Self Supporting 25G Tower installations and is adjustable up to 24 inches. Comes with Adjustment Bolts and Rail Clamps. The ROHN 25G tower can be in used in guyed, self-supporting or bracketed configurations according to specifications in the ROHN 25G catalog.